And if you agree with him you are about to set eyes on your ultimate Christmas present. 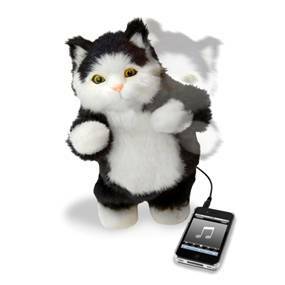 For UK based gadgeteers Thumbs Up have unveiled – wait for it – the Dancing Cat Speaker. There are very few specs to give you. All you need know is that you plug your musical device into the speaker via the 3.5mm jack and watch your new feline friend boogie. See below. You can buy one for £39.99 from Play.com very soon.